This is the second in a series of blog posts featuring the fabulous sponsors of the 2017 Rhinebeck Trunk Show. Alice O’Reilly, the dyer behind Backyard Fiberworks, and I have an ongoing text conversation, and a few months ago she shared news with me about an exciting project: she and Manhattan-based designer Kathleen Dames were collaborating on a series of books on knitting around the world, starting with my home of New York. How did the idea for I Knit New York come about? When Kathleen started designing a mini collection for Backyard Fiberworks, she made the mistake of telling Alice that she had always wanted to do a collection inspired by New York City. Alice picked the idea up and spun it around. Then it started to grow. “What if it were bigger? What if there were more designers? What if we did more of them?” So, now we are One More Row Press with plans to visit cities around the globe. Aside from designs, what will the book include? We will have profiles of our New York designers, our favorite places in the city to find yarn and notions, and where to knit, plus all the inspiration that New York City has to offer. Which designers do you have lined up for the book? 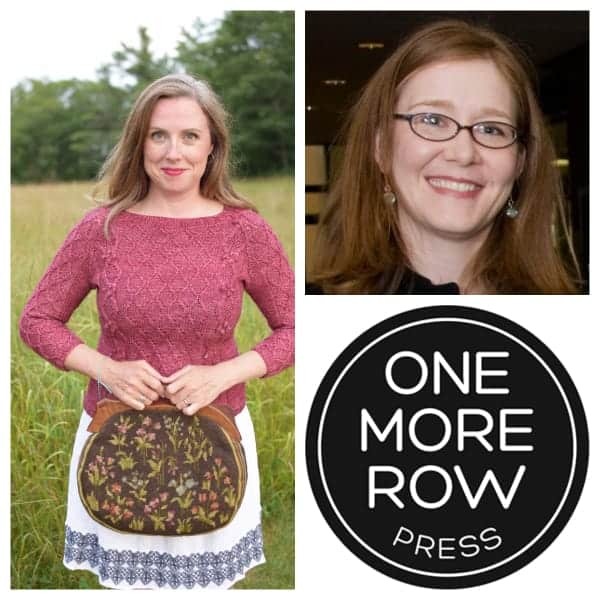 Brittney Bailey, Kathleen Dames, Kirsten Kapur, Xandy Peters and Lars Rains, plus an introduction by Kay Gardiner [of Rhinebeck Trunk Show sponsor Mason Dixon Knitting, with all the yarns from Backyard Fiberworks. Will the designs themselves be inspired by New York City? Yes! We were inspired by Washington Square, Central Park’s Sheep Meadow, Holly Golightly in Breakfast at Tiffany’s, the phenomenon of Manhattanhenge and more. Which other cities or places will you be including in your series? Our flights of fancy so far have inspired thoughts of Paris, Tokyo, Buenos Aires and more New York. Of course, we are open to suggestions. 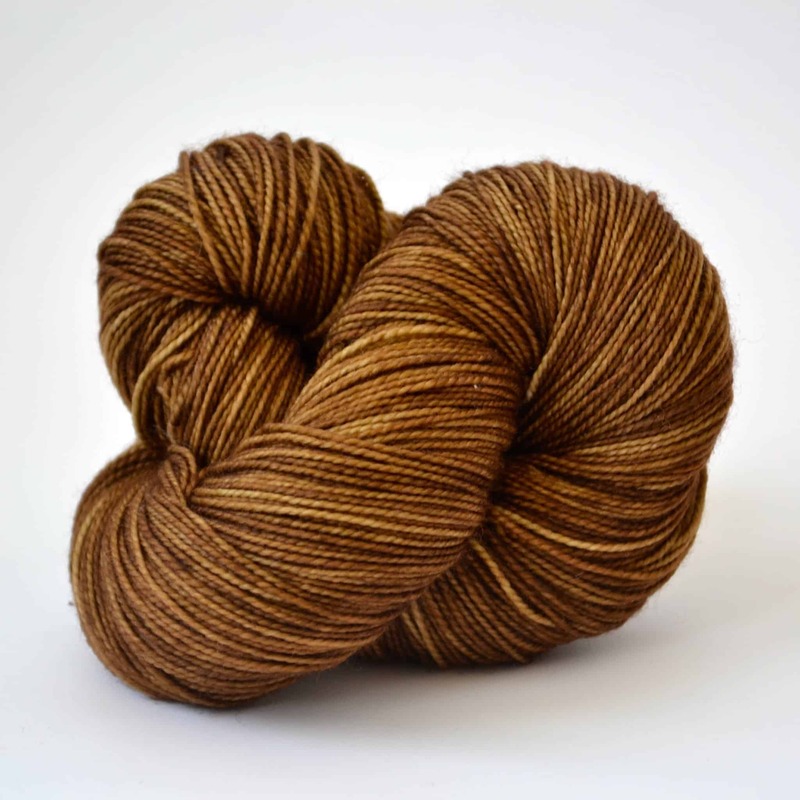 Backyard Fiberworks Sock in Walnut. When and how did both of you learn to knit? Alice: I don’t remember learning how to knit. I could always knit, just like I could always read. 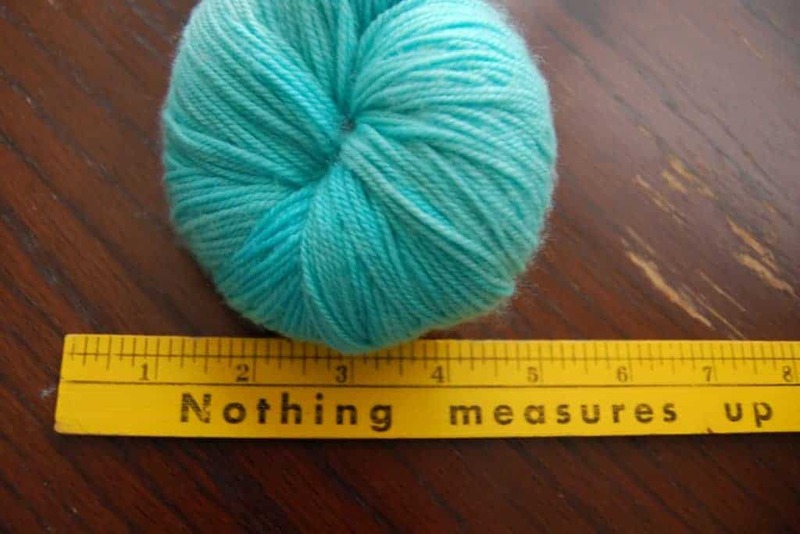 Kathleen: My maternal grandmother taught me when I was young, but she lived far away, so it wasn’t until 2003 that I relearned with a friend from my publishing days, and we would knit at lunch. From the very beginning I was making changes to patterns to create the knits I wanted, so I was always on track to be a designer (being on the creative side of publishing as an art director helped, too). What is your most memorable FOs? 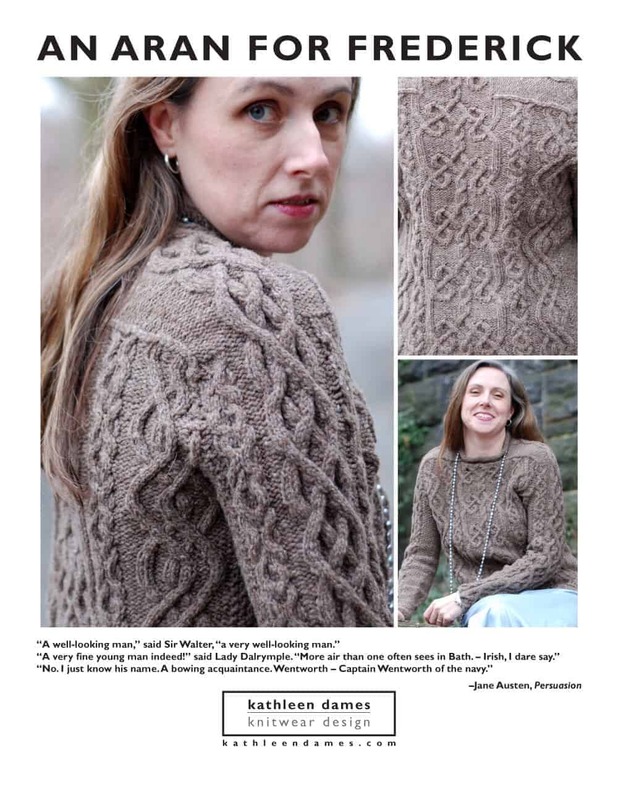 Kathleen: An Aran for Frederick from the first issue of Jane Austen Knits (2011) — Inspired by Frederick Wentworth, Anne Elliot’s love interest in Persuasion (my favorite Austen novel), it’s a pullover that tells a story through cable patterns (Ensign’s Braid, Twin Waves, XOXO, Celtic Flourish), and the construction (seamless, in the round, from the bottom up, EZ hybrid yoke) makes it exciting to knit. I call it “knitting Sudoku” because you have to keep all these cables going *while* working the shaping that forms the yoke — it really keeps you on your toes. Kathleen, where’s your favorite place to knit in New York City? I can’t just say, “On my couch, with my cat George,” can I? On the subway (when I can get a seat), sitting on a park bench in Morningside or Riverside Parks, at my LYS Knitty City (shout out for their summer knitting lessons in Bryant Park — a fabulous place to knit). But most of the time when I am off my couch, I’m taking in the wonders of New York City because I’m not a native — I’m #tenyearsanewyorker, so I still find everything pretty fabulous: Grand Central Terminal, Patience and Fortitude (the lions guarding the NYPL), the Costume Institute at the Met, the Statue of Liberty from the Staten Island Ferry. And that’s the tip of the iceberg! I try to share my knitting and New York adventures on social media because I still find it all so exciting — the people, the architecture, the history, the geography. New York is a special place, so Alice and I are very excited to share it with I Knit New York. This entry was posted in Rhinebeck trunk show, Sponsored post and tagged books, Brooklyn, indies, interview, NYC, patterns, Q&A, rhinebeck, rhinebeck trunk show, yarn.